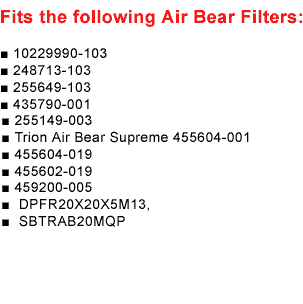 Home>Air Bear Filters > Air Bear Filters | Fits All Trion Air Bear 20x20x5"
Filter came promptly. Fit nicely in air bear compartment. I have been a dedicated user of these filters exclusively for over 10 years. The company's service is excellent, whether by phone or computer. 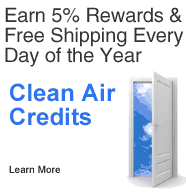 The filters are reasonably priced and usually there is a coupon for even more of a discount. The filters have never failed. I use two or less per year for the furnace and A/C usually changing spring and winter. I just hope this company never goes out of business.